In an effort to share my thoughts, insights ,and ideas surrounding modern product design with others, and, more importantly, to help myself stay informed and receptive of modern design trend, I will be writing a series of pieces on this very topic. It is my hope that Murphy’s Hypotenuse will supplement and expand the breadth of insightful content that Trig's Tangents is all about, while exploring the trends, uniqueness, and in some cases, horrors, of today's product design landscape. Enjoy—Patrick Murphy, Industrial Designer, Trig Innovation. Often, product developers find that continued functional evolution of their products reaches a point of bringing diminishing returns. This phenomenon occurs when developers have exhausted all of the cutting edge materials, manufacturing techniques, and technical magic they had at their disposal during the product’s life cycle. Real functional development for the product is now at a standstill, barring some disruptive materials innovation by NASA, for example, or is, at the very least, too slow to offer the product any tangible advantage in its marketing or distribution. Rule Number One of successful product design is that form follows function—we designers are, ultimately, at the service of the engineers. But once the engineers reach their limits in functional development, form exploration, independent of established function, then becomes free game (and this, my friends, is where the real fun begins). Enter the golf club. Technologically light years ahead of its predecessors, the golf club is the primary tool used in one of the most popular and lucrative sports around the world. Not only does the golf club benefit from a global, affluent market, it also thrives from its pivotal, central role in the sport—specifically, participation (and successful participation, for that matter) in golf depends very much on the peripheral equipment utilized by the players. Given these market conditions, the clubs of yesteryear, composed of hickory and steel, have given way to everything modern science has to offer, all in the name of extracting more performance out of sponsored pros and convincing customers that with the same clubs they, too, can shoot lower scores. Just in the last generation of product development, we’ve seen carbon fiber shafts, titanium bodies, micro-textured polymer grips, flex-tuned impact zones, sway-correcting counterbalances, and modular weight systems. Sounds like the attributes of a Formula 1 car, doesn’t it?! This $75 billion industry has guaranteed its wealthy customers that if the technology exists, it’s available to the consumer. Now the golf equipment industry finds itself in that position of diminishing returns on all-too-incremental advances in function—revolutionary, disruptive functional innovation has caught up and golf clubs are now technically in tune with the most advanced equipment in any industry. 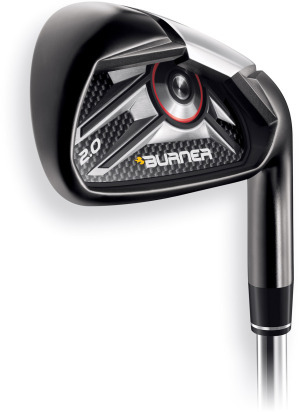 Not content with this stasis of function and form, it’s clear that many club manufacturers have returned to form to distinguish themselves in the market. The golf club is already, from my own artistic perspective, an extremely interesting sculpture. Completely asymmetrical, but balanced, somewhat bulbous, yet aerodynamic – a club’s unique shape is the result of a unique, singular function—striking a golf ball in optimal fashion. Add to this famous template the most creative visual exploits of an industrial designer and you get specimens of the most innovative aesthetic and form design of today’s product landscape. Dark, refined, dangerous, and elegant in its technical expression. Color and finish are everything here—the palette (or lack thereof) maintains the club’s unapologetically dark demeanor, but the designer uses texture to break up what might be a monotonous field of satin black, only breaking it to apply eye-popping silver graphics. The broad, smooth surfaces on the bottom face are interrupted by a rich 3-dimensional feature reminiscent of futuristic body armor, a la the movie, “TRON: legacy.” The sharp, trapezoidal angles at play here remind me of box cutter blades, and, at the sunken feature’s deepest point, the off-plane facets catch light in high-contrast to make the feature pop. This Callaway number exudes quality, ruggedness, and horsepower. The smooth silver finish is jewel-like in appearance, reminiscent of a masculine wedding band of fine metal. This finish wraps around to adjacent surfaces of the club’s front, evoking solidness and weight, as if that entire portion of the club head were cast from pure steel. The stamped and engraved style of the main logo further adds to the fine metal motif, like a blacksmith’s trademark. But the most striking elements here are the pockets of bright red, faceted angles. Their color and rough texture instantly remind me of the investment-cast and powder-coated v12 engine blocks of high-end supercars. A supercharged V12 inside a golf club! Absolutely brilliant. Hidden beneath an orthodox façade of your typical, smooth-backed iron is an abruptly carved pocket containing one striking visual feature. Ringed in a thin red circle is a precision-lathed eye composed of multiple conical surfaces—looking exactly like what I believe the designer wanted consumers to see in this product: a freaking laser beam! Terminating in a fine pinpoint in the middle of this complex array of lens-shapes, this evil eye appears to have the capability of firing a golf ball with guided-missile precision. To add to the advanced weaponry effect, sharp structural bosses affix this laser to a woven carbon fiber club core. Surfaces emerging from underneath the club almost close in around the eye, as if shrouding it from the sight of its prey.